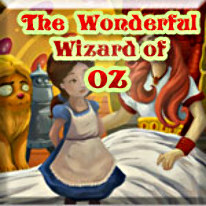 Enter the whimsical world of Oz and be sucked back into a timeless classic! Based on the tale of a magestic land, climb aboard for a magical ride into the world beyond the deserts. With the Wicked Witch of the East now gone, it is your duty to free the remaining Munchkins from their jeweled prisons and bring order back to the land of Oz. On the way, help the Scarecrow find his brains, the Tin Woodsman find his heart, and the Cowardly Lion find his courage! Are you brave enough to face the Wicked Witch of the West and the great and terrible Wizard of Oz? Only you can help Dorothy and Toto find their way home!